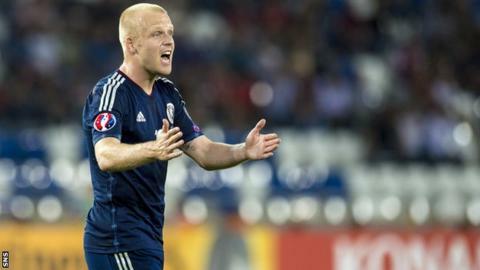 Steven Naismith believes Scotland's squad is nearing its "prime" and says getting to a major finals is one of his main motivations. Scotland missed out on Euro 2016 and have not featured at a World Cup or European Championship since 1998. "I've not really thought about ending my Scotland career," Naismith said. "I don't want to finish my career without having played at a major tournament so that's definitely a driving factor." Though Gordon Strachan's Scotland missed out on next year's finals in France, England, Northern Ireland, Republic of Ireland and Wales have all qualified. "It's frustrating that we won't [be in France] when we felt we were just as good, so that has got to drive us on in the future," said Naismith, who has scored six goals in 41 international appearances. "The last campaign was probably the cruellest campaign but we still believe that we can do something as a squad. "There are maybe a few players that will have a look at their international career and think I've got a decision to make but the majority are coming into their prime so I can't imagine there will be too many walking away." Former Kilmarnock and Rangers player Naismith was linked with Norwich City during the summer but remained at Goodison Park and soon scored a hat-trick in a 3-1 win over Chelsea. However, he has not featured regularly in recent weeks. "When Norwich were interested in me in the summer, it was the manager [Roberto Martinez] who said he didn't want it to happen. But as a player you need to think about all your options. "The manager said we'd speak about it again come January time so we'll do that. "At the start of the season I wasn't playing then got thrown on nine minutes into the Chelsea game and not many people would've seen me scoring a hat-trick. That shows you how quickly it can change. "However, as long as this good run [that Everton are on] goes I'm just going to have to get used to being on the bench. "We've got a squad that is full of unbelievable young talent."